God, I hate period pieces. Actually, that’s too much of a blanket statement. I hate most period pieces. There’s something overly formal about them (like the costumes, stifled emotions and, well, formalities) that almost immediately turns me off. I have enjoyed a few of them. I’m a huge fan of Marie Antoinette, for example, but one could easily argue against that film’s inclusion in the period genre. Its camera work is handheld, its soundtrack a pop culture treasure trove, and let’s not forget the conspicuous tennis shoes in Miss Antoinette’s closet. Not terribly “period film” of them. In short, these types of films usually have to win me over. The King’s Speech had me from its brilliantly shot opening sequence, which involves the setup of a BBC broadcasting room simultaneously intercut with Albert, the Duke of York (Colin Firth), preparing for an address. 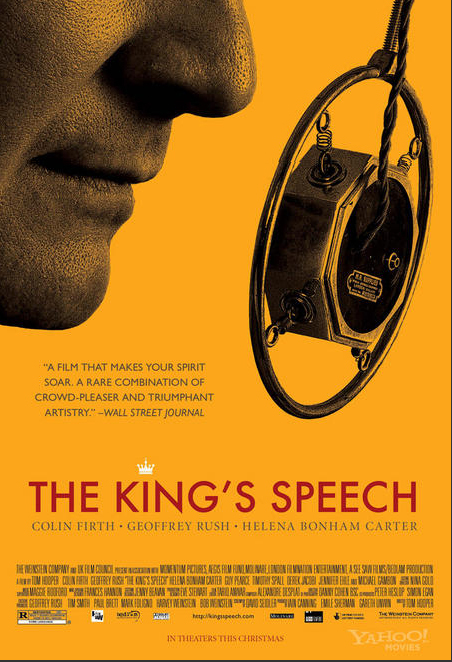 Director Tom Hooper made some interesting choices with the camerawork, filling his film with oddly (in a good way) composed shots rife with negative space and using wide lenses that distort the world around the reluctant soon-to-be king, making it seem as though the world constricting around him. Perhaps this is why he stammers so much? There are, in fact a myriad of reasons why Albert stammers and some of them are uncovered when he begins seeing Lionel Logue (Geoffrey Rush), a failed actor turned speech therapist who promises to help the future king control his impediment using some rather unconventional methods. Not the least of which is becoming his friend. Albert’s wife, Elizabeth (Otherwise known as the queen mother who wouldn’t die, then did, at the age of 101), played by the ever reliable Helena Bonham Carter, is sympathetic and tremendously supportive, but can only do so much. The most interesting part of Albert and Lionel’s burgeoning friendship is the monarch to commoner dynamic they must overcome. When the two men first meet Albert takes exception to being called by his first name. Bear in mind, Albert is by no means an arrogant man. He’s quite the opposite, in fact. It’s just that that’s simply not done. Lionel clearly has a rather blasé attitude towards royalty and royalty is all Albert has ever known. The final scene, in which Albert (now King George VI) gives his first wartime speech, is harrowing. As Lionel watches his friend with great pride we see that Albert has earned his crown. He who acts most kingly is king.